Where family, friends, and fun all come together! The Cascade Family Motorcycle Club (CFMC) is exactly what the name implies; a motorcycle club that is geared around families! Club families, including both riders and non-riders, are from all over the western portion of Washington state and we share a true love for the outdoors. Members of CFMC give hundreds of volunteer hours back to the sport we love via trail maintenance and other off-road support activities. We here at the CFMC are proud of our heritage. We are a Northwest Motorcycle Association (NMA) charter club. Our on-going support of the NMA includes the annual hosting of two regional NMA events for the off-road motorcycle community. In addition to our ties to the NMA, the CFMC is also a proud member of the Blue Ribbon Coalition (BRC) and the Washington Off Highway Vehicle Alliance (WOHVA). We sponsor events in both of the NMA points series; off-road racing and Enduro Competitions. 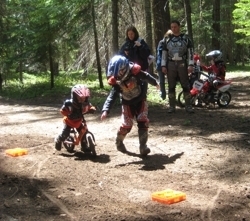 Our two events are the Grizzly ISDE and the Black Bear Enduro. For more information about CFMC events please check out our Events page. A description of our events, a little of the event history, what riders can expect at our events, current year planned events, and previous year race results can all be found on our Events page. CFMC now has a long term lease of 4000 acers in Thurston County. With this new leased land CFMC members will have a unique space to camp, ride and create new riding trails that will not be available to non-members. So do you like camping out and dirt bike riding with friends? Do you have kids or other family members, including yourself, that are just getting started into the sport? Are you willing to give a little back to the sport via joining work parties for trail maintenance, etc? If so, we here at the CFMC are always looking for families that, like us, want to enjoy the outdoors and are willing to help ensure that future generations have a place to ride and spend quality time with their family and friends. Send us an email. We will be happy to share more information about the club and review with you what is required to become a member of the Cascade Family Motorcycle Club.